REGABOND-S, it's the amazing microsuction foam! REGABOND-S is the amazing microsuction foam tape which can stick and tear repeatedly with no glue. The features and applications are as following. The backing of REGABOND-S is acrylic foam. One side is ordinary adhesive though, the other side has no glue. The non-glue side has innumerable nano suctions. The suctions can stick and tear on almost any flat surfaces similar to ordinary suction cups. Though the suction force weakens when the surface becomes dirty, you can clean it with a wet tissue or a scotch tape, and it will work again. You can fix temporary signs to the wall without bond, adhesive tapes, screws, or nails. Stick the adhesive side to the sign, and fix it to the wall with the micro suction side. You can stick and tear the sign without leaving any residue on the wall. REGABOND-S is used as LCD gaskets in smartphones. It shuts out the dust perfectly, and is removable if repairs are necessary. When you drop the phone, the foam absorbs the shock and protects the acrylic or glass window from breaking. It is also effective for fixing of the battery not to move in the housing. As the cushion for the microphone and speaker, it improves the qualitiy of the sound. As the rubber foot of the docking station, you can stick and tear it easily on your desk repeatedly. Affixing a tablet or a smart phone to the folio case have become popular applications recently. If it is used as a rubber foot for a tablet, smartphone, smartwatch dock, you can fix it tightly on a desk and which prevents it from falling down. For a stand or a docking station of a smart phone or a tablet, REGABOND-S is used for attaching a smartphone or a tablet to the stand and fixing the stand on a desk. Different from magnets, it can stick to almost any flat surface. You can use it around computers with no bad influence like magnets. You can use it for various stationeries (bookends, pencil stand, name plate, dry-erase e.g.). And use it freely with your idea ! 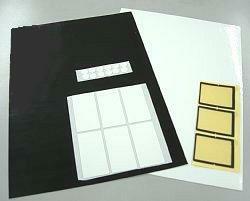 If you need sample sheets, please don't hesitate to ask us!